Don’t you agree that decorating your home should be enjoyable instead of stressful and frustrating? 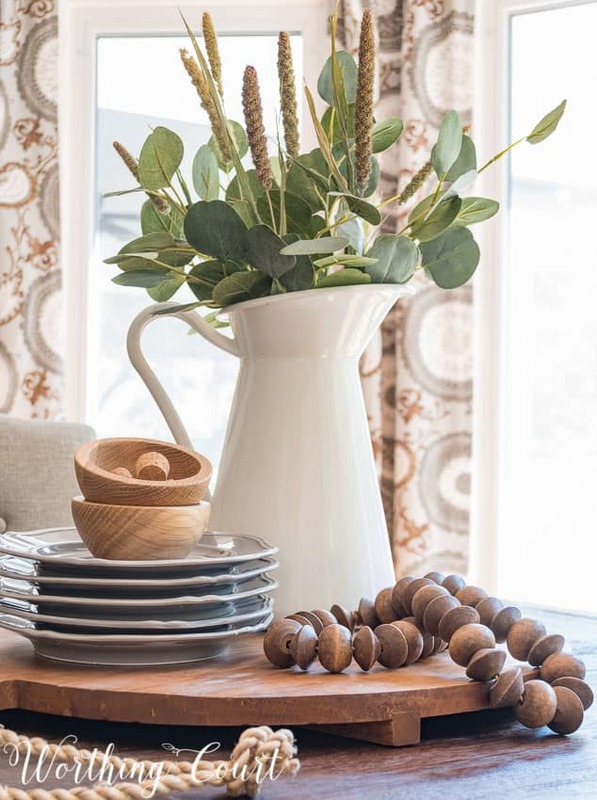 It doesn’t matter if you’re working on the overall look for a room or your entire home or just trying to decorate for a season or holiday – I believe it should be fun! 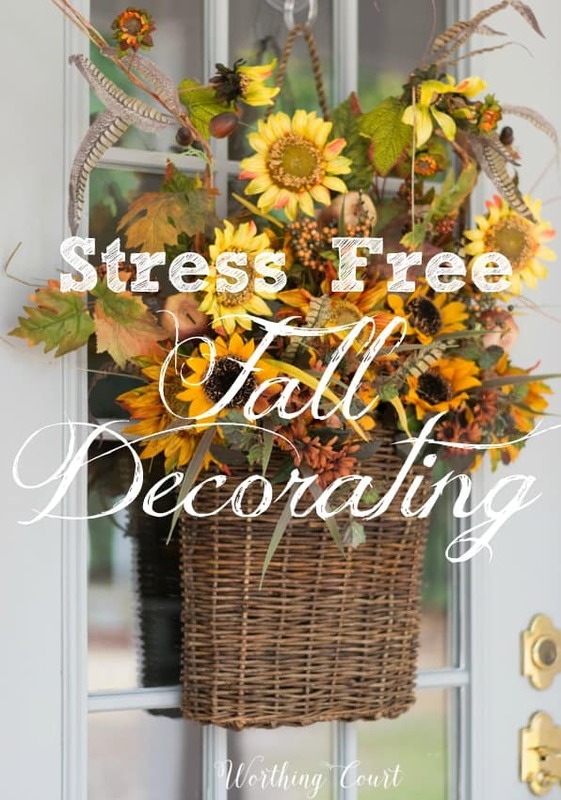 We all have enough drama and frustration in our lives, so let me give you a few no stress ideas to make your fall decorating a joy instead of a chore. This centerpiece, on the dining room table in my former home, is one of my most favorite ever! It may look complicated, but it isn’t. 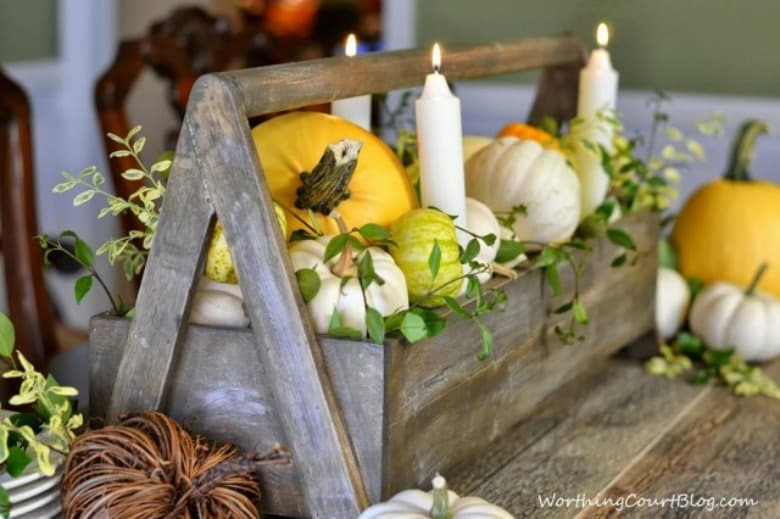 Fill a container, any container, full to overflowing with pumpkins (real or faux) then tuck in a few candles and sprigs of greenery (again, real or faux) into the empty spaces. Better yet, put together a centerpiece in all of 5 minutes! I recently put this centerpiece together for late summer, but it will probably wind up staying through fall. You can look at it and tell how easy and simple it is. Bread boards make a great base for a centerpiece, then all you need are just a few things arranged on top of it. I created this elegant looking (but easy!) fall vignette in the foyer of my former home, by plopping a mum into a container, adding raffia (or you could use Spanish Moss) around the base of the plant, and placing a mix of pumpkins and gourds on a tray beside the mum. 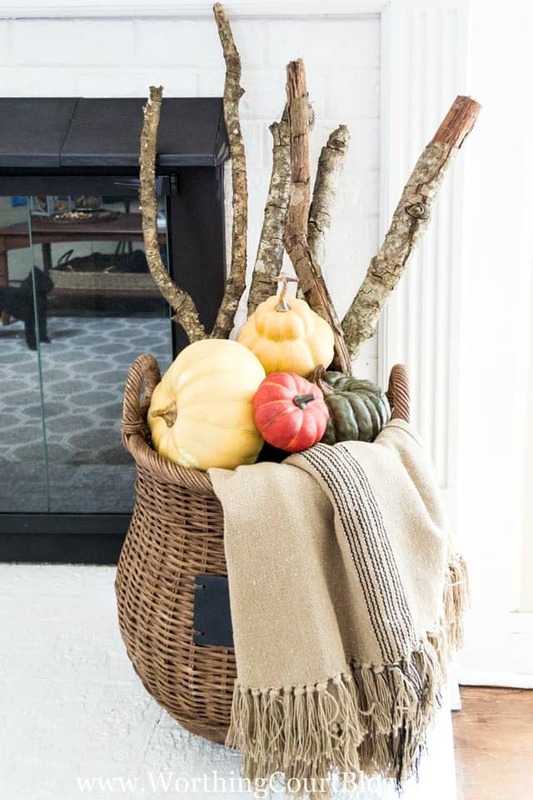 Finish the vignette off by adding one more fall’ish item from your stash. 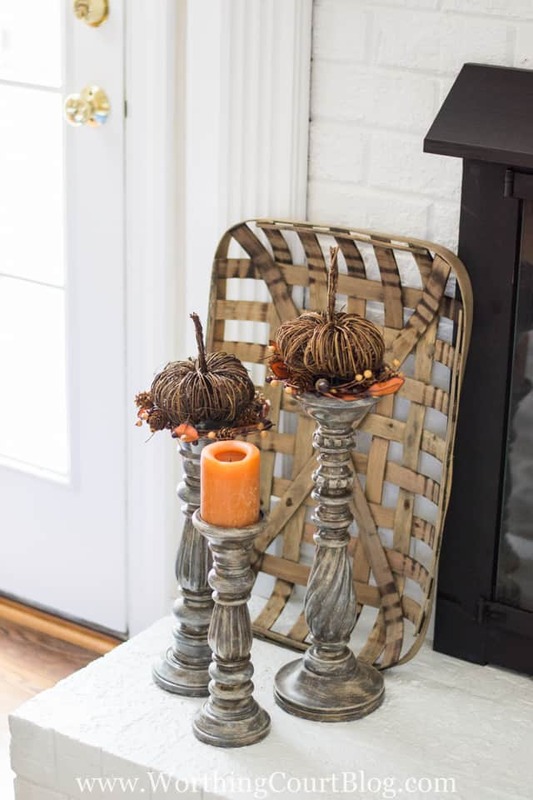 Three candlesticks + two pumpkins + one candle = instant fall. Y’all it doesn’t much easier or stress free than this! They don’t even have to match, but using various height candlesticks adds more interest. You’re bound to have a basket of some sort lying around. I simply arranged sticks from my backyard, a throw and some fake pumpkins to create this fall display. And here’s a secret – the bottom of the basket is stuffed with old sheets to fill it up. You can’t see them though, because they’re covered by the pumpkins piled on top. You don’t have to make an elaborate wreath for your door. Grab a hanging basket and fill it with artificial foliage bushes. The retailers continue to sell more and more realistic looking faux plants and combining them all into one bush sure does make decorating much easier. Try something different with your outdoor containers besides filling them with traditional mums. These planters were soooo unbelievably quick and easy to create and I received many compliments on them. Everyone loves something unexpected! Do you get stressed out and frustrated when you decorate? I admit that sometimes I put so much pressure on myself, that I’m easily frustrated if something doesn’t turn out just right the first time around. Note to self: Relax – it’s only decorating. Wow, these are all wonderful ideas! Fall is my favorite season, I’m ready to get a project going! I really love the natural look you give to your decorating. It doesn’t look fussy and it’s a look I could try to replicate. Thank you for the inspiration. I am ready for my porch next. I love your ideas and plan to incorporate some of them . I like to stack the pumpkins and need some fall pillows for my bench. This post makes me SO READY for Fall. Thank you!! I adore the Ammo basket filled with fall flowers! I am going to do this for my front door this year. I’m feeling very much pumpkin envy! Where is the best place to stock up? Clearly I need about 100! Hi Nancy. If you’re in the market for medium to large fake pumpkins, I’ve found the best prices by watching for sales at my local craft stores. If you’re only looking for some small ones, the dollar stores usually carry them this time of year. You have such an eye for the detail and placing everything just so! Beautiful accessories and the way you use them is a gift! The hanging basket arrangement on the door is beautiful and I have that basket!! I will have to go shopping for supplies! I love how you decorate the urns by your front door! I live in Florida where it’s still way too hot, so I can recreate this using faux pumpkins and not worry about them rotting in the heat. I love all these wonderful centerpieces. I want one if each. i love the three candlesticks two pumpkins and a candle it’s fabulous! I have a wooden tool box and I am definitely going to put some fall decor in it! Great ideas! 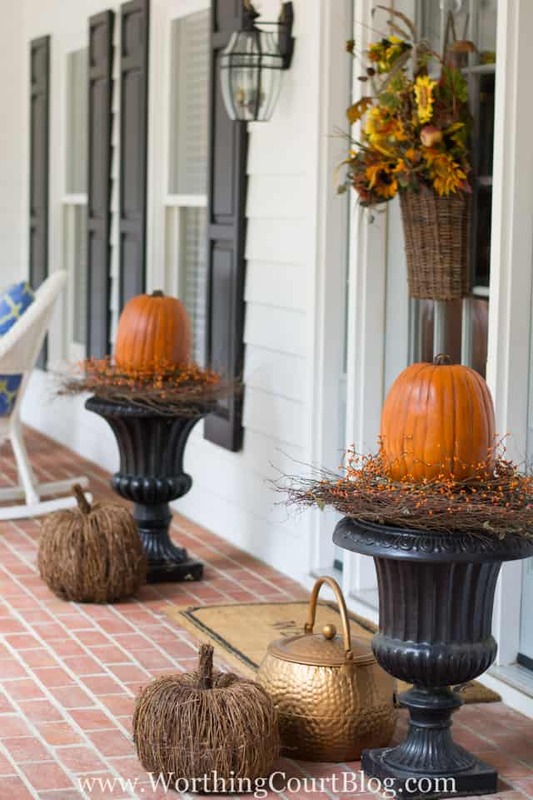 Love the urns with the pumpkins and grapevine wreaths! Lovely centerpiece! I can’t wait to try this. You have given me many doable ideas for fall decorating and I appreciate that. 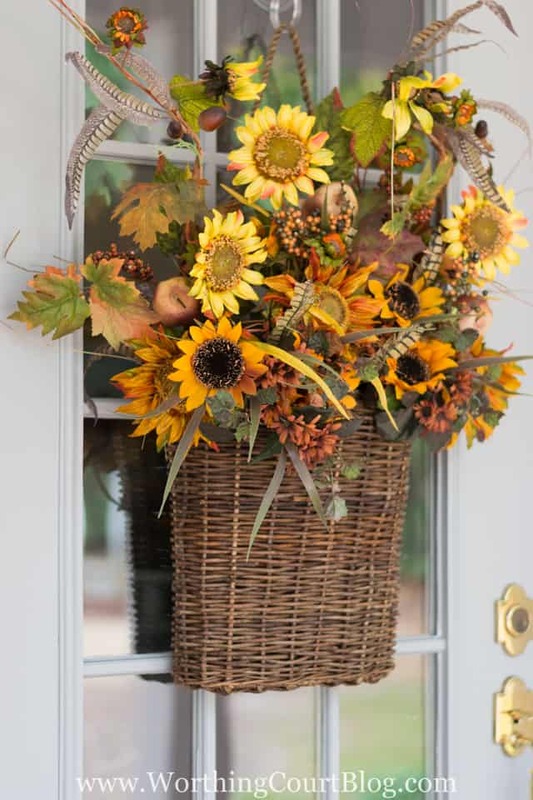 Love these ideas – can’t wait till the cooler weather hits North Florida! Really lovely ideas that all look amazing! thanks so much for sharing on craft schooling sunday! The feathers in in flower arrangement are so clever!!! 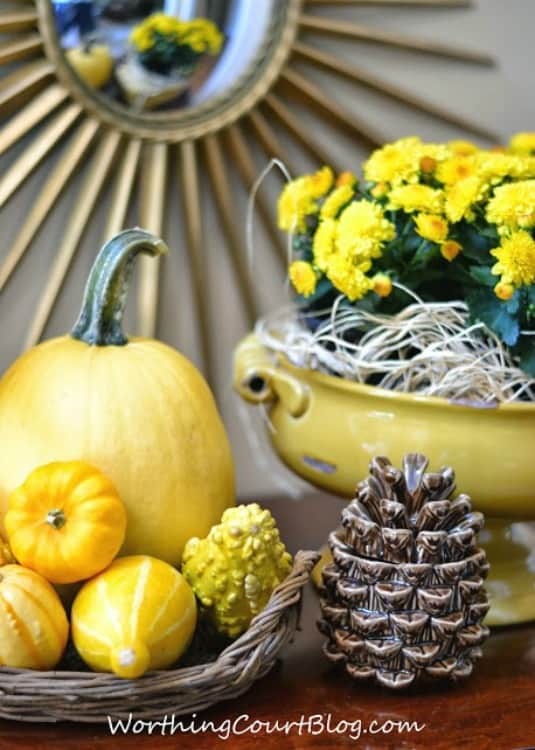 I love all of these ideas and agree with you about keeping fall decorating simple. I go all in for Christmas, but for fall, I like to keep things pretty simple. Thanks for sharing at Snickerdoodle. Pinning. Great ideas. Definitely going to try a few of these. I’m starting small. Thanks for the tips! I love all these ideas! I’m decorating as I read this and I will definitely be using some of these! 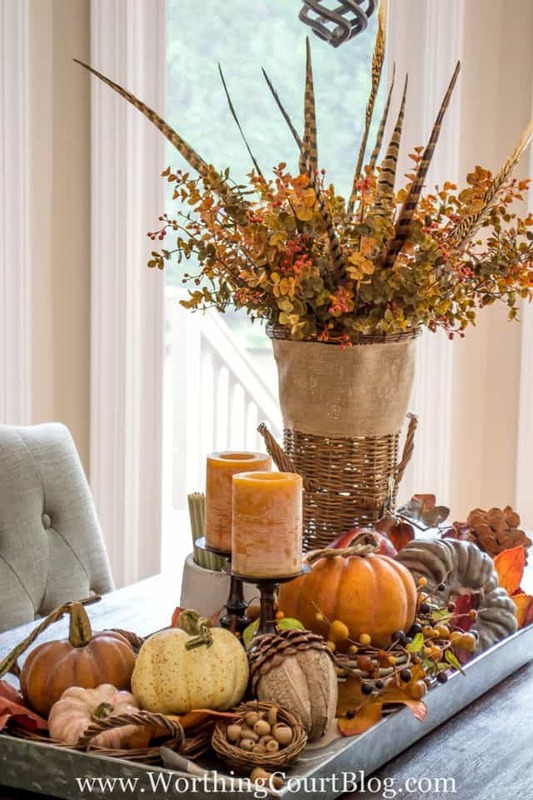 Some of your ideas are so simple and easy but make a nice fall statement without being fussy. I like that!